The Ravell'd Sleave: Am I Ambitious or Delusional? Am I Ambitious or Delusional? OK, probably delusional because I will admit to not being a very ambitious person in general. But then again, hope springs eternal where crafts are concerned, and I do have some ambition in that area. Case in point: This past Saturday, The Tim, Hamlet and I headed out to Manayunk to visit my friend Lisa at her yarn store, Hidden River Yarns. I enjoy going to Manayunk and to Lisa's store, but we don't make it there very often because even though that part of Philadelphia is not technically too far from us, it's also not very close, and we are lazy. Anyway, we arrived and found a fairly close parking place (parking there is as tricky as anywhere else in the city), and started our walk down Main Street. Hamlet thought this was all wonderful, because a) car ride, and b) new smells! He got *really* excited when we saw the Dog Bakery - and yes, of course we went in. I thought he was going to explode with excitement. We didn't stay long because he was being ridiculous, but in honor of it being National Pizza Day, we bought him a treat in the shape of a slice of pizza. Then, on to the yarn store. My primary reason for wanting to go was to purchase a copy of this book. 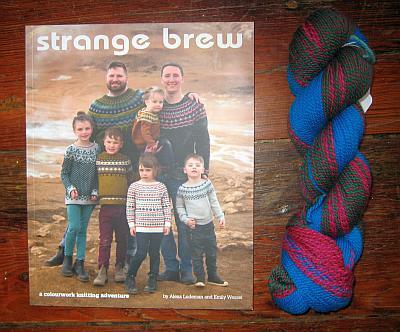 Strange Brew, from Tin Can Knits, is a hard one to find, and when I learned Lisa had gotten a shipment, I asked her to hold one for me and said I'd pick it up this weekend. It's not hard to find because it's a rare, old book, but rather because it is so popular. And if I could get it from Lisa, that would be not just shopping locally, but saving on shipping fees. We had a good visit with Lisa, and Hamlet got a lot of cuddling and petting, so he was happy. But he was just so excited about everything, he was kind of out of control, and annoying. I gave him his treat, and that was successful, but he was still too excited for us to stay for very long. Then I noticed that there was also a basket of Crazy yarn sitting there ... I had bought two skeins a year or so ago, but had not yet used it. Lisa showed me a project she was making that used three skeins and OMG I loved it! The pattern was The Shift, by Andrea Mowry. I'd seen some iterations of the pattern on podcasts, but none of them looked as amazing as the one made with Crazy yarn! I decided to take a look and see if another skein spoke to me. It's been quite a while since I bought yarn, so I wasn't going to get it just to get it, but rather I had to find one that just simply had to come home with me. And I did. GAH! I love it soooooo much! Look at those colors. To be 100% honest, I don't clearly remember what the skeins I already have look like, but I'm not worried because I know they are colors I really like. I don't feel bad, as far as buying the yarn, but I have to admit that even before I got the book, I wondered about my state of mind. 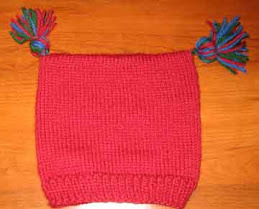 I have done very little colorwork, and have made very few sweaters, none of which had colorwork yokes. However, seeing projects made using this book and reading reviews of it made me think it was something I really wanted to own. Because I kept thinking about it, I decided to find a way to get a copy for myself. Because ... someday, right? Not anytime soon of course, since I am currently waiting for the OK to knit again, and I want to finish the projects I had underway. However in my ambitious/delusional state, I'm thrilled to think that my future could involve something so different from anything I've tried before. I'm really excited about the yarn and the project I want to make with it. I have done well not buying yarn lately, and though of course I would love all the yarn in the world all of the time, I haven't been feeling deprived or upset that I was not buying anything. But I know I would have gone home and wished I'd just bought this if I left it in the store. In any event, have a good week - we're already working on Monday, surely it will be all good from here! How about, "courageous." I like that word better if you are going to tackle one of those sweaters. I love the new yarn, hope you are feeling better soon. That winter cold is really tough, I had it around Christmas. I think that book was a good buy! And, I am working on yarn for Nightshift as well - that crazy yarn will be PERFECT!! That yarn is just the kind I'd have come home with, too. Love the colour contrasts. I'd say hopeful rather than delusional, and definitely ambitious. It's nice to have a someday goal for when you can knit, and you sound enthusiastic about it. Plus there is your cool Crazy yarn! Pretty crazy yarn. Colorwork is fun and not that difficult (at least in my opinion). I made Sigla last year and it knit up fast and was fun. Can't wait to see what you make!! I gave up feeling bad about buying things just because I want them years ago. It gives me so much pleasure just to dig through my stash and know it's there. I am full well aware that I will never knit most of it up or use all the patterns I have collected but I don't really care anymore. I just love it all. 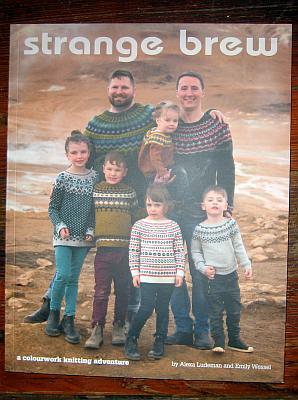 I do love the sweaters on the cover of that book. I was thinking about starting another Lopi type sweater and then I remembered I already have one in production....see. It all seems to work out. GO FOR IT! Hope it plays well with the ones you already have. I have that pattern in my queue so maybe I need some crazy yarn. One more question--is there more to the name than Crazy? Because there is lots of crazy yarn out there. A colourwork yoke sweater is a great way to experience colourwork - you can do it! I love the Hamlet story - I can just picture a super happy, wiggly puppers! ". . .because he was being ridiculous. . ." is the funniest thing I"ve heard today. I like Tin Can Knits, but colorwork truly intimidates me. Bridget if you went in for one thing and only came out with 2 at a yarn store you are winning the craft games, if you ask me. I like TinCanKnits and I'm sure you'll have a blast with your new projects. I hope you stay healthy. Have a good week!